The Douglas Aircraft Company developed the SBD Dauntless in a pre-war competition for the 'next generation' carrier dive bomber. The aircraft was two-place monoplane of all-metal construction (except for the flight control surfaces) powered by the Wright R1820 radial engine. The Dauntless was a dive bomber, the steeper the dive, the more likely the bomb will go where you're aiming after release. Like other USN dive bombers, the SBD employed split flaps that doubled as dive brakes to keep the aircraft from accelerating beyond its maximum speed and ripping the wings off the aircraft. Consequently, when the bomb is released, it will accelerate away from the diving bomber. To keep the bomb that is hung on the centerline bomb rack from falling through the spinning propeller (a bad thing), a trapeze mechanism was used to swing the bomb out below the propeller arc during release. The SBD-4 was an incremental improvement over the SBD-3 which was highlighted by the replacement of the aircraft's 12 volt electrical system with a 24 volt system. This change allowed a wider range of avionics options including the installation of the ASB radar. Due to shortages of radar sets, early production SBD-4 aircraft reached the field without radars, but late production SBD-4s came with the radar pre-installed. In addition, a new propeller and fuel pumps rounded out the improvements over the SBD-3. The SBD-5 received a 1200 horsepower engine and would become the most-produced version of the Dauntless series with over 2400 were built, with some sent to the Royal Navy, RNZAF, Free French and Mexican Air Forces. 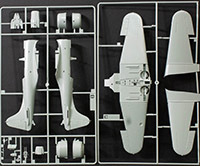 The Accurate Miniatures SBD-series kits were first released over ten years ago before the company was eventually shuttered. Even so, these AM kits were the best kits of the SBD in any scale for a time until Trumpeter released their 1/32 Dauntlesses. To date however, nobody has produced a better kit of the SBD in 1/48 scale and it is only logical that these SBD kits would be sold in other companies' boxes. To date, the A-M SBD kits have appeared in Italeri, Eduard, and Academy boxes. This kit is a beauty straight from the box and there is little else you might want to complete this model. 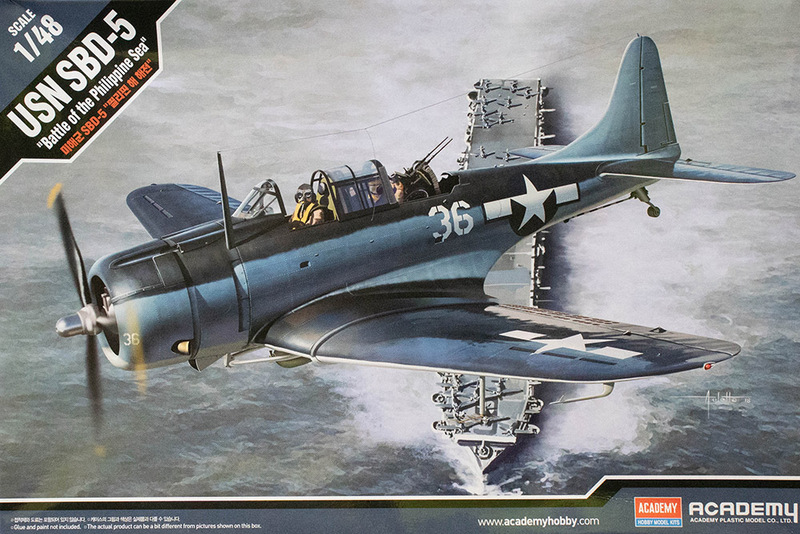 If you don't have an SBD-5 in your collection, this is going to be the best of them all in 1/48 scale. Be careful not to invest in the various photo-etch sets that tend to overcomplicate or add minimal improvements to this kit's out-of-the-box details.